Scathophaga stercoraria or the Yellow Dung Fly is one of the most familiar (but probably ignored!) flies in many parts of Assynt, particularly where large mammals are present. As its common name suggests, it is generally found on the faeces of larger mammals such as cows, sheep, deer and horses. It visits the dung to breed. S. stercoraria play a vital role in the animal kingdom as their activities are necessary in the natural break down of the dung. They have an average lifespan of one to two months and the larger males are bright orange-yellow in colour while the females are a duller green-brown. The main prey of the adults is smaller insects, mostly other flies but they also consume some nectar and dung for additional energy. Females will spend most of their time looking for food in surrounding vegetation and will visit the dung only to mate and deposit their eggs. 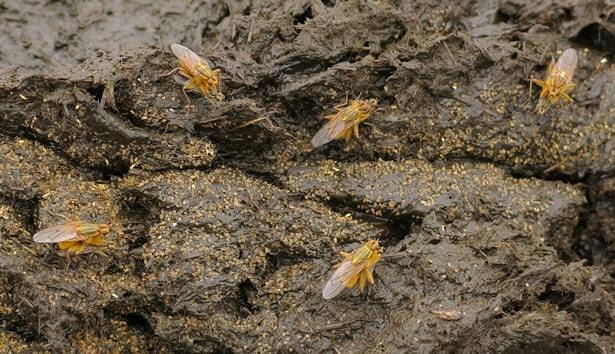 The males however spend most of their time on the dung pats waiting for visiting females. During this time the males feed on other dung visiting insects. S. stercoraria themselves are an important food source for several species of birds and they also fall prey to other insects. These photographs were taken near Stoerhead Lighthouse on 18 October 2015 and show mating pairs on cow pats.